This year I've been following some amazing kindergarten teachers on Twitter. I started out teaching in a preschool, so I have a deep appreciation for all things early childhood. But I have also felt that some element of play is missing in the middle grades. As I looked at what the kindergarten teachers were posting and saying, I wondered, "How can I adapt this for my older students?" They are so full of fun, enthusiasm, and questions. They deserve open-ended learning experiences and beautiful experiences just as much as younger students. As some forces are pushing me to make my classroom even more rigorous and demanding, I want to balance things by providing creativity and room for intellectual growth. I decided to dedicate about 20 minutes each day to open-ended work. In the first few weeks of school, I spent great care in developing the culture of our centers and what would happen there. It was not without bumps. 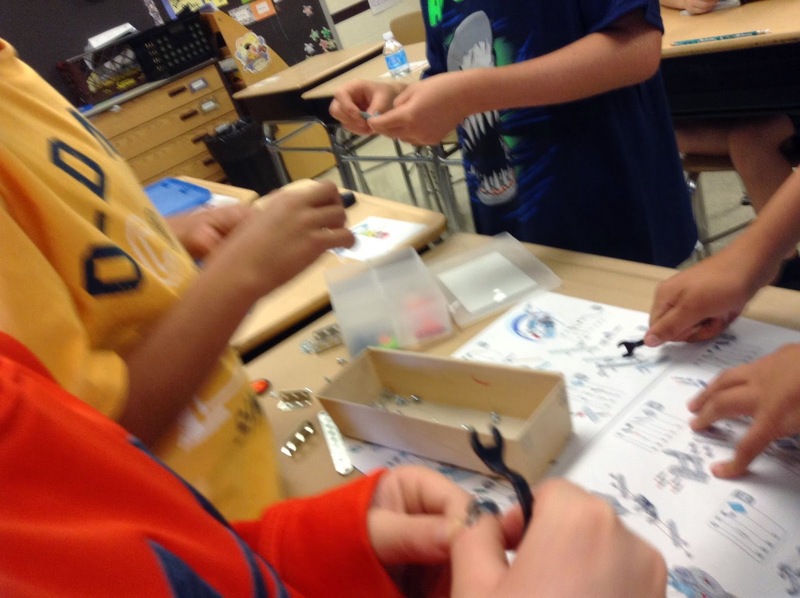 Many students associated open-ended free time with recess. I had to constantly remind them--"This is a learning time," and ask, "Are you taking advantage of the learning opportunities in this room?" 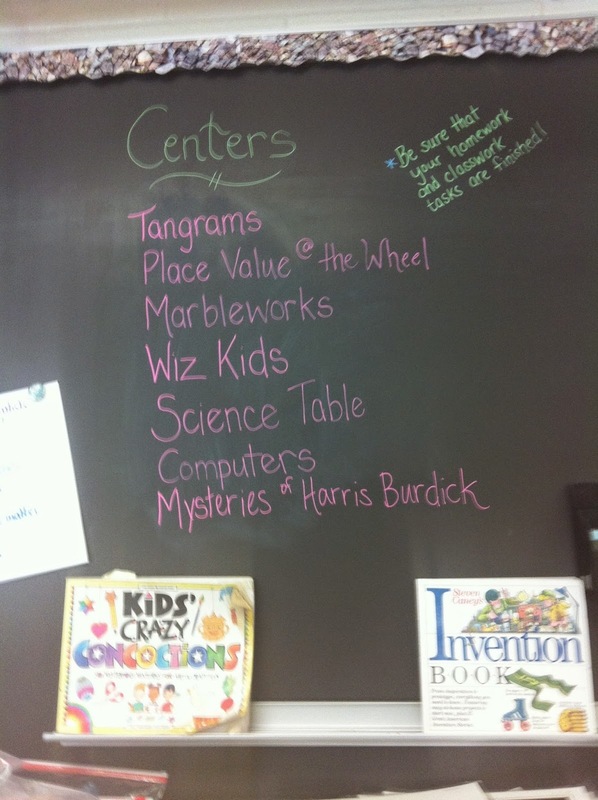 As you can see from the centers list, I chose a wide range of activities that could happen in many different places in the room. Issues of access and squabbling caused us to make some tweaks to our routines, such as making daily schedules for Marbleworks and the computers. Early on, kids started asking to do things that weren't on our list. My natural inclination was to say, "Sure!" However, sometimes I have to go across my natural inclinations. (I am always tending toward chaos.) I said, "For now, please choose something that is on our list." Then, as months passed, I would update the list with their new suggestions. relationships between teaspoons and milliliters, the accuracy of their water bottles, the volume of a marble apple. 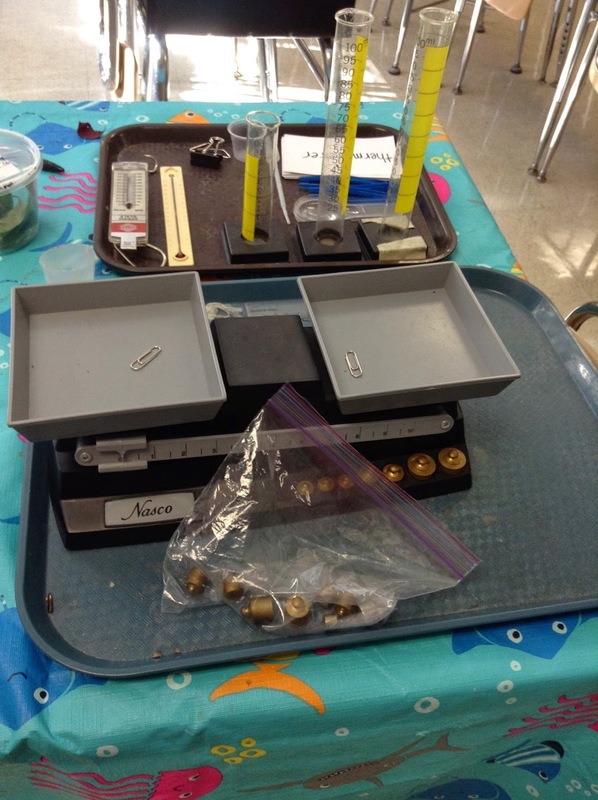 Weeks after the measurement center waned in popularity I heard one student telling another, "Don't use the liter cube to measure--it's not accurate." was going and what they could do to make the closets better. Another student, seeing the neglected animal cards, created an identification game. From the corner I could hear kids calling--"Dragonfly! Otter!" as they raced each other to identify the animals. Students also work on open-ended, optional activities, such as their Bat Week posters, Frolyc, bird observations, reading, and computer games. Checking in on animal observation cams has also been a favorite activity of late. 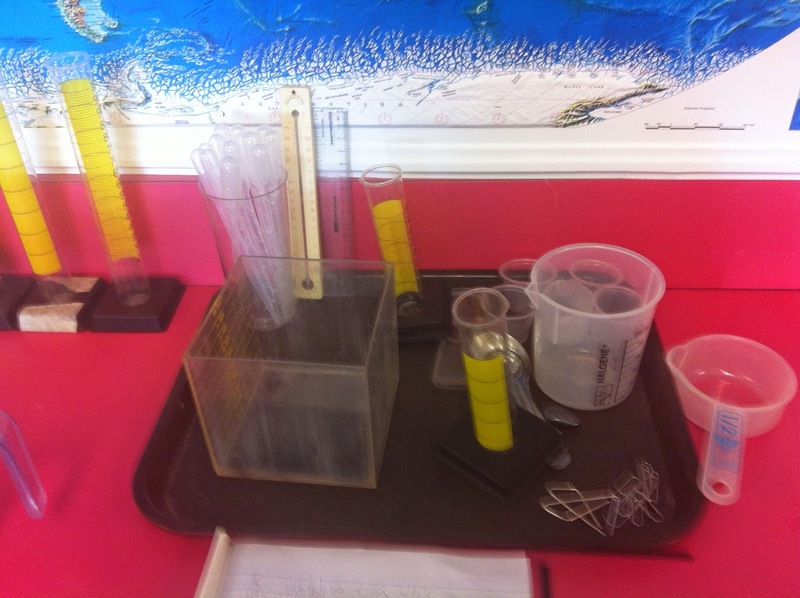 The time has also become an opportunity for students to work on their own science investigations. With the onset of cold weather, we've had several ice experiments. It's been fun to hear kids talk to each other about using the measurement tools from early in the year to create more sophisticated experiments. Our morning work has also tended to run into other parts of the day. When there are odd moments in the schedule or kids have finished one activity in a lesson it has become natural to just move into the open-ended activities of center time. One day, we moved from our centers time into indoor recess. There was no perceptible change in the quiet, busy hum of the room. I said, "It's recess," but nobody really changed what they were doing. In the weeks to come, I plan to add more opportunities for science experiments. Students have written and conducted their first simple experiments, and now are eager to try more with vinegar, baking soda, food coloring, and the like. Just like every new activity, I expect this to be hugely popular. of all of the items together. routine in my classroom always works beautifully and is perfectly wonderful in every way. But I can't ignore the bumpy spots and the thorny questions. One day last week I counted 17 different activities going on over the course of the morning. They were all rich, meaningful activities, and I was fascinated at the range of curriculum areas and topics that they reflected. But are students switching too often? I have noticed several students engaging in at least four different activities in 20 minutes. I've intervened a few times, but I've also stood and watched, and wondered. Should I tell students to choose one activity and stick to it? Or should I just allow them to enjoy this time of complete choice? There are also some kids who sit back and opt out of the social aspect of this time. These students love to read and sit, completely absorbed in a book. My short-term attempts to pull them into the social whirl of activity are politely tolerated for a day, and then they go back to reading. A few students seem to just watch what the other kids do--I'll find them looking over the shoulder of someone playing a game or looking at our class blog. Again, these students politely take my suggestions, but do not engage themselves on their own. Should I be more insistent about pulling these students in? Or should I wait, hoping that the new activities I'm introducing on Tuesday will do the trick? For all of my out of class reflections, often my best decisions about open-ended time come about when I am in the moment--when five kids are calling me over to see something, a colleague has stopped by to ask a question, or someone brings in something unexpected and exciting to look at. These are the moments when I know that time for centers and play is worth pursuing for my fourth grade students. I've wrestled with this question for many years. Many of my students come to fourth grade with huge word deficits and large gaps in speaking and writing vocabulary. Others come with an eagerness to learn new words and build upon what they have picked up from their reading. I need a vocabulary routine that helps students to be excited about new words...a routine that is manageable and practical...a routine that has lots of room for new additions and learning. Last year I wrote about putting words on word rings for students to study. Each word is put on the ring, with the definition on the back. Students read their words with instructional assistants, parent volunteers, and me. When a student can correctly read the word and explain its meaning, I use a fancy hole punch to punch the card. After three punches, students can remove the word. Lots of good things are going on here! Kids are practicing decoding with multi-syllabic words. Kids are talking about words and their meanings, and get to have time with caring adults. For me, the routine is super-simple to explain to anyone who comes into my classroom to help--the aide who has 10 minutes free due to a schedule change, the parent who can come in one morning, the substitute teacher who has a free period. This year we've made some innovations. The wonderful ESL teacher who is co-teaching with me put our word lists on Quizlet and showed me how to print flashcards directly from there--how simple! The instructional assistant who manages all of the cards has even figured out how to engineer the paper so that the cards can be made with the fewest cuts possible. When kids get five cards removed, they earn a coupon for our classroom economy. Because many of my students are strongly visual thinkers, I've started adding drawings to our routine. We have lots of tracing paper in the storage closet (why? Not sure), and kids have found it calmly peaceful and engaging to trace the pictures as we talk about the words. In the weeks to come, students will take over the drawing part of the routine. 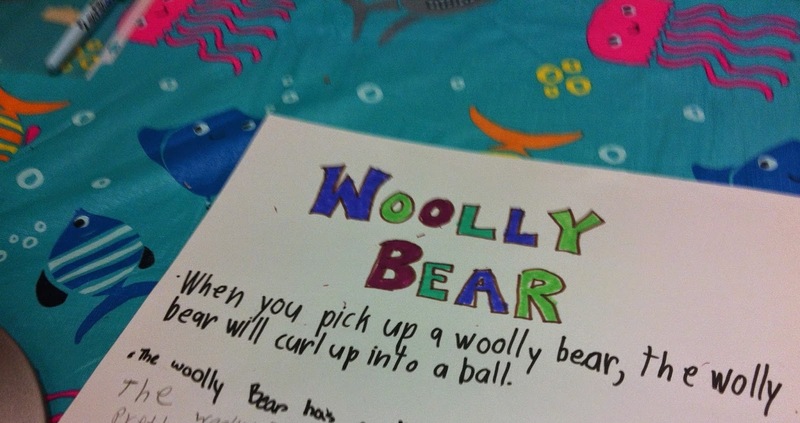 Is this the best vocabulary routine ever? I don't think such a thing exists. Each new teaching book tries to tell readers that this new thing is the ultimate in teaching. However, I think that good teaching resides in the place where practicality, big dreams, and pedagogy meet. 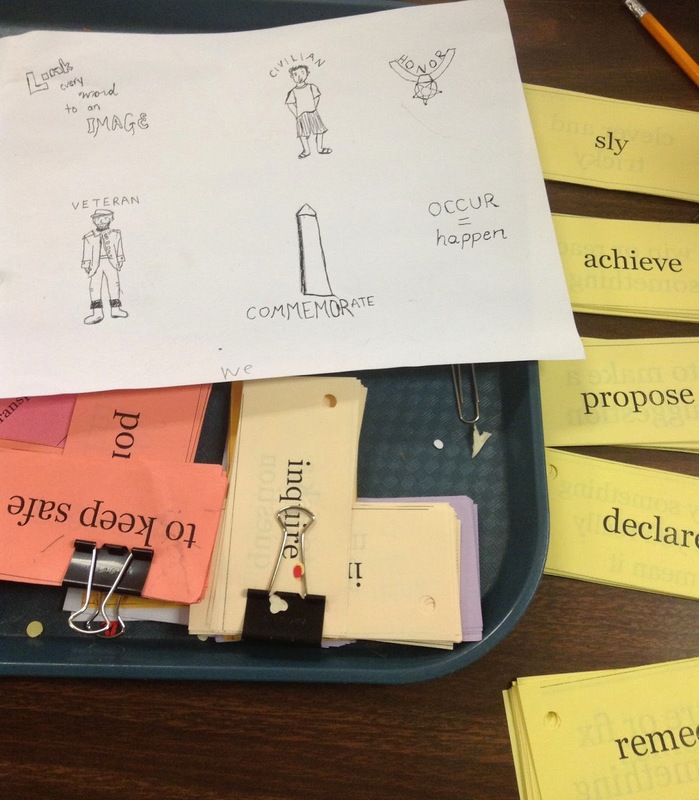 Hopefully you can carve out your own functional and delightful routine for teaching vocabulary! Young readers have a great deal of trouble with dialogue. It seems as if the task of every autumn for me is to help readers learn how to recognize dialogue, figure out who is speaking in dialogue, and visualize conversations as they read. And what an important task this is! Dialogue carries plot details and characterization. When students don't know who is speaking, or don't realize the importance of dialogue, they miss essential details of a story. As I looked at student responses, I noticed several patterns. 1. Every question correct. About a quarter of my students answered every question correctly. This doesn't mean that their instruction is done--in fact, it means that students are ready to really explore dialogue and learn how to wring more meaning from it. 2. Trouble with Line 4. Notice how the dialogue in Line 4 does not have a speaker tag. Readers have two ways to identify the speaker. They could look at the textual conventions of quotation marks and a new paragraph to know that someone new is talking. Alternatively, they could look at the context of the conversation to know that the miller wouldn't thank himself. Students who did not answer this question correctly often said "the miller" or even "sir". 3. Trouble with "You look tired". Teachers who know kids--really know kids--will not be surprised to hear that a decent number of students said "the miller" in response to this question. Skilled adult readers are shocked by this, as they clearly see that the miller has dropped out of the story by this point. However, readers who are having trouble managing characters in their heads will assign dialogue to anyone that seems convenient! I hate "going over" tests. This is probably a major character flaw. Instead of "going over" the answers, I made clean copies for all students who scored less than 4/5. Then I gathered the students in small groups to reteach. Together, we read the text and aloud and answered the questions again. I used sticky notes to symbolize each character, so that we could talk about who was in the story when. This helped students to see that Hans leaves the mill on Line 10, which makes the miller drop out of the story. The small group setting helped students to talk out their issues and their misconceptions. "Well, of course the miller wouldn't say thank you," one student said. "It would be kind of silly for him to thank himself for gold." "Oh, the rider is a different person!" another student exclaimed. "Well, that makes a lot more sense." I waited until after we had discussed the passage to hand out the scored assessments that students had already taken. Then we were able to talk about new understandings. What did students know now that they didn't know then? How were they thinking through the story events differently? How might this help them with their independent reading books? I eventually wrote three dialogue assessments, which I have added to Analyzing Story Elements. It took us a few tries to get it right! Even now there are still some students that are working on identifying narrators in first person stories. More lessons on identifying speaker in dialogue can be found in my book, The Forest AND the Trees. Hawai'i and Alaska are both so big and interesting that they deserve their own texts, which aren't quite finished yet. I have lots of texts and activities for student iPads over at Frolyc. If you want to see new activities, subscribe to the What's New on Activity Spot Pinterest board. This month I have worked on Genres: Science Fiction and Fantasy, Autumn Poem, Anthony Wayne (a chronological order text) and more. Over the past two weeks, I have been working with point of view in my classroom. What an interesting endeavor it has been! I have found myself looking at stories, my instruction, and my classroom in new ways as I have thought about the standards and how to help my students understand point of view. In the Common Core standards for fourth grade, students need to "compare and contrast the point of view from which different stories are narrated, including the difference between first and third person narrators." This standard is pretty comprehensive! Not only do my students need to be able to identify first and third person narrators, but they also need to explain how narration techniques impact a story. This is a pretty tall order for students who are still having trouble separating content from structure. Side note: I know that everyone in the technology world hates PowerPoint. But I love using this medium to highlight different aspects of text. Putting large text on the screen for everyone to see and talk about gets students engaged. Adding interesting pictures makes the conversations even better! I have some go-to books for introducing point of view. Bigmama's and Shortcut, both by Donald Crews, are two of my favorites. These include the first-person pronoun "we", which is important for students to see, and are quick reads. I also read Instructions by Neil Gaiman, which is told in second person. 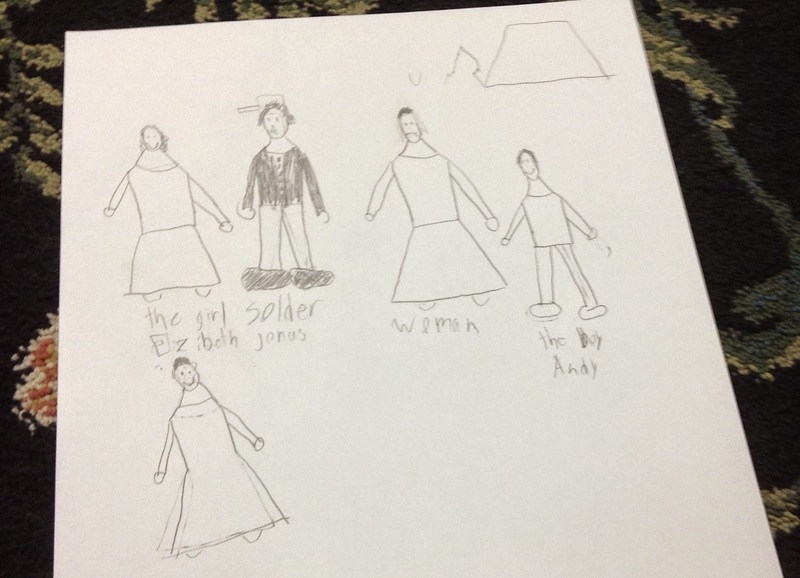 For each story, we talked about the point of view and how we could figure it out from the pronouns used in the book. 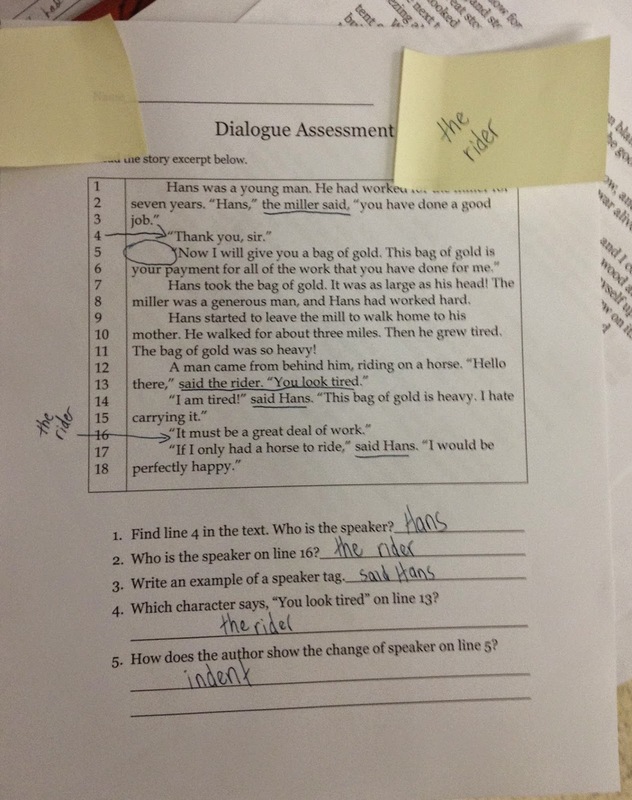 After students could identify first and third person with reasonable accuracy, I had to move students to the next level--being able to really consider how the use of different narration styles impacts a story. -What is the point of view of the story? -How does this point of view affect what we know about the characters and the events? As students talked, I circulated to hear their conversations. These formative activities are vital for me as a teacher, because it helps me to see what knowledge is in the classroom. From this conversation, I was able to see that students could identify point of view, but didn't have much to say about how the point of view affects the reader's knowledge. My next steps were clear! One way to help students have this conversation was through read-alouds. Write This Book by Pseudonymous Bosch sparked some interesting discussions regarding first and second person points of view. I also shared a story written from multiple points of view. A retelling of Stone Soup, this story uses first person throughout, but switches between characters. (I hope to make this story available in the near future. In the meantime, please write to me if you would like a copy.) This style was a challenge for readers! They read it on their own for the first read, and then we assembled together to discuss it. I modeled how to use information in the text to draw the different narrators and characters, which would help us to track the story. As we looked at how the characters' thinking changed from the beginning of the story to the end of the story, I came to an interesting realization. In general, my students are having trouble with the role of character thoughts in first person text. They don't see that, in first person narration, a character's thoughts infuse the entire text. When tasked with looking for an example of a character's thinking, they were trying to find an explicit marker like "I thought". This realization is shaping my planning for next week. What can I expect from 9 and 10 year olds? How can I scaffold them to expand their understanding? Thinking about point of view has made me look at every book in a new way. I started a Point of View board on Pinterest to share different books and how they can be used to consider point of view. -US Leveled Geography readings are coming! Last year, I wanted to add a social studies component to my fluency instruction. As a result, I wrote texts for each region, carefully leveled at fourth, third, and second grades. So far, I have the Northeast, Midwest, and South prepared. Check them out! -I've updated formatting on Thanksgiving Reading Activities and Centers. -January 2015: You can find "Stone Soup" in my new activity set, "Exploring Point of View".